Analog Way Pulse2 PLS350-3G Seamless Switcher/Scaler with 8" Preview Screens - Hire | On Event Production Co. This rack is custom built and comes complete with an Analogue Way Pulse 2 - PLS350-3G and two 8" Blackmagic preview screens. 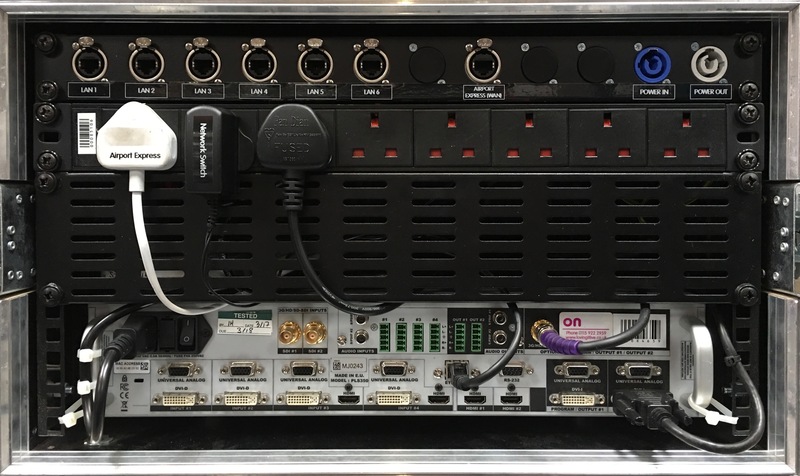 The Pulse 2 PLS350-3G Hi-Resolution Mixer Seamless Switcher from Analog Way is a versatile, high-quality A/V presentation mixer/switcher that offers up to 8 inputs and can display up to two live sources. Compatible signals include DVI-D, HDMI, Universal Analog, 3G/HD/SD-SDI all via 14 input sockets. The PLS350-3G two frame layers offer background and foreground positions. With new quick frame functions, a foreground frame can quickly hide all other layers when necessary. Custom output management gives a good fit for any display resolution, including LED walls and other non-standard formats. This unit comes complete with Dual 8" Blackmagic preview screens housed within the flightcase. The PLS350-3G can be operated from the front control panel as well as a laptop when combined with the user-friendly RCS2 intuitive Remote Control Software designed for the new Midra platform. Compatable with Windows, Apple Mac and Linux. We also have Windows laptops and Apple MacBook Pro laptops available to hire should you require.